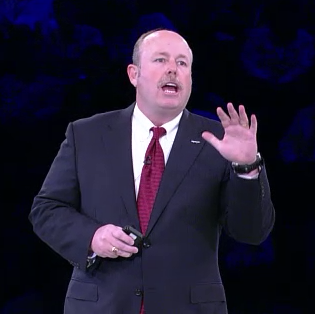 Microsoft COO Kevin Turner sees prime opportunities for partners to "rescue customers" from IBM, Oracle and others, according to his WPC12 keynote. "VMware, Oracle, Apple and Google are great competitors. We'll respect them but we're not going to fear them. This is our time to take back the dialog." Here's the keynote recap. Microsoft COO Kevin Turner sees prime opportunities for partners to “rescue customers” from IBM, Oracle and others, according to his WPC12 keynote. “VMware, Oracle, Apple and Google are great competitors. We’ll respect them but we’re not going to fear them. This is our time to take back the dialog.” Here’s the keynote recap. Cloud revenues grew more than 100 percent across most all geographies and products. We knocked it out of the park. Over 50 percent of desktop PCs are deployed on Windows 7. The opportunity is to continue to accelerate with Office as well. Hyper-V won share vs. VMware for the first time. SQL Server is the worldwide unit share leader now in the database market. Customer satisfaction is at an all time high across every audience we track. We grew it five points collectively together. Give yourselves a hand. Microsoft is spending more than $9.4 billion in R&D this year. That’s $3 billion more than the next technology company. It’s unprecedented that every MSFT product is being refreshed in a 12-month cycle. Windows 8 is the top priority, with great enterprise app a big priority. It’s about winning with Office 365 every time. When we talk about the cloud, we’ve got it all in market today. Many of you haven’t made the shift. The train is gone. Get on. Vs. VMware: We have 27 percent market share and we’re growing twice the rate of VMware. I know there are some partners hanging on to that VMworld. Hanging on to that high cost of VMware. Look at what you’re about to see. Now our momentum is picking up that they actually lost share this past quarter. For those who are still hanging on to VMware, you’re late but we still love you. Get onboard with Hyper-V. Vs. Apple: “Apple has a great product, but PC Mag readers gave Windows Phone the top award. Them, “Apple makes great hardware. But we have some differences on how we see the OS.” He quoted early reviews that said Apple has lost its way in operating system software. Microsoft is building more retail stores, including first-time launches in Puerto Rico and Canada, with holiday pop-up stores also coming. Microsoft Bing is beating Google on search relevance. Please. If any customer needs to be rescued from a vendor, they need to be rescued from Microsoft who is still charging for Office, Windows and other commodity software which hasn’t changed in any meaningful way in over a decade and their competitors are pleased to give away without a license charge. As Microsoft pushes their CALs license structure, no one can drop one component of their Microsoft licensing without dropping it all. Microsoft is generally has the highest IT spend of any vendor at most companies and they do not deliver anywhere near the most value. Sam: The VAR Guy welcomes a healthy dose of skepticism. Turner insists that Microsoft’s customer satisfaction ratings are at the highest levels ever. But yes, the Client Access License (CAL) business model seems under attack as cloud apps proliferate. It’s sort of interesting to attend WPC and get caught up in the crowd energy. Sit in the stadium and you believe Microsoft is set to really have an incredible fiscal 2013. Get back home and skeptics begin to tell you that the company remains under attack on all fronts. That said, The VAR Guy will strive to share both sides of the MSFT story at all times. Thanks for reading. I suppose crowd energy also makes it easier to say things like “Get customers on Windows 7 because that’s the fastest way to Windows 8.” while he knows better than we do, both platforms will be upgradable to 8 at the same time for the same price. I’ve tried new math on a few calculators. No matter how I add time now from XP to 7 plus time later from 7 to 8, it never seems to equate to being faster than XP to 8 in one single process. He was in the midst of many other enterprize centric statements, so he probably meant to indicate less issues getting to a single platform before an enterprize wide upgrade than coordinating across various platforms at a single time later. I just hope everyone gets the whole ROI picture before starting any migrations to 7 on smaller scales. 2K: The fastest route to anything does, indeed, remain a straight line. XP to Windows 8 fits that description… if Windows 8 works as advertised.